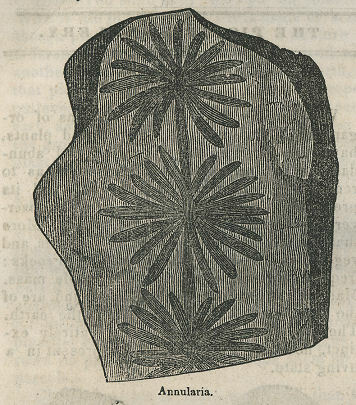 This extract from The Self Instructor, and Journal of the Universal Lyceum, edited by Josiah Holbrook, was one of the few illustrated works on fossils published in early American works for children; the Youth’s Cabinet had earlier copied a description of a mastodon skull found in Ohio in 1838. 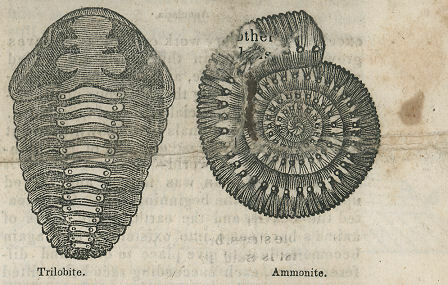 “Organic Remains,” however, seems less about prehistoric creatures than it does about the usefulness of the study of geology, that “fashionable, interesting, and highly practical science.” The illustrations in this piece may have come from the original publication, as the Self Instructor was published in New York at this time. 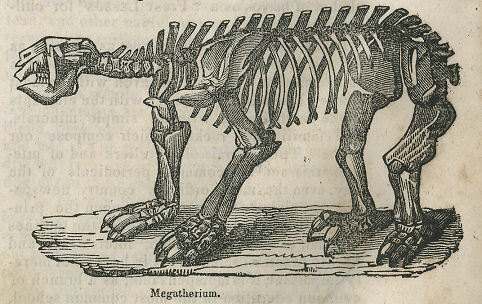 The standard illustrations of the trilobite and ammonite are here joined by the very popular megatherium, which was featured also in Wonders of Geology and The Schoolmate. Within a few years past, the remains of organized bodies, such as animals and plants, have been found in so great variety and abundance in various portions of our globe, as to render still more wonderful the earth and its productions, which to the most careless observer are curiously and wonderfully made. More than nine thousand species of animals and vegetables have been found deposited in rocks: frequently forming nearly their whole mass. Many of the organized bodies thus found, are of the same species as now live upon the earth. The greater portion of them are entirely extinct, not being known to exist at present in a living state. The trilobite, just represented, was an ancient and curious animal, but not now known in a living state. It was for some time classed among insects, but is now supposed to have been a crustaceous animal, from one to six inches long, covered with a series of folds, by which the animal could roll itself up, like many animals now known. The eyes of the trilobite are so well preserved in rocks, as to show that they were composed of about 800 lenses, placed in the ends of tubes, arranged side by side. It was once of the first inhabitants of our globe, and is most common in gray wack rocks. The ammonite resembled the nautilus, as its interior was divided into compartments, or chambers, by cross partitions. Animals of this class were formerly numerous, and frequently of a large size. With the exception of one or two species of the nautilus, they are now unknown in a living state. its body 12 feet long, and 8 feet high. Fore feet a yard in length, and 12 inches wide, terminated by gigantic claws. Its thigh bone nearly three times as thick as that of the elephant. Its teeth admirably fitted for cutting vegetables, and its general structure fitted it for digging in the ground for roots, on which it principally fed. excellent elementary work on geology. Leaves growing as shown in this plant, are called whorled, or verticillate, and are frequently beautiful. They are among the numerous plants imbedded in rocks, especially in coal formations. The plants and animals here shown, give but a slight view, the merest glimpse, of the wonders of the ancient world—of our globe as it was long before man was formed and placed upon it. Since the beginning, when God created the heaven and the earth, many races of animals have come into existence, and again become extinct, to give place to other and different races, each succeeding race being fitted to the state of the earth at the time they inhabited it. Besides the elements and structure of rocks and mountains, and the remains of an ancient animated world, geology treats of volcanoes and earthquakes, and the various changes which they have produced in our globe. It also treats of soils, and shows to the farmer, not only the elements of which they are composed, but the mode of improving them; and hence may be considered s the foundation of agriculture. It is hence no less useful as a branch of common school instruction, than it is curious and wonderful as a subject of science. The elements of geology are also as remarkable for their simplicity, as the whole science is for its vastness, and the extent of its ramifications. It is hence highly appropriate as an early subject of instruction, and evidently ought in all cases, to precede in its alphabet, the alphabet of books, as a “First Lesson” for children. It has also now become almost as common as the elements of geography, and of course it is supposed that every person, even with the most limited education, is familiar with the elements of the science, and with the simple minerals, and families of rocks, which compose our globe. The journals of travellers and of missionaries, and the common periodicals of the day, even the most ordinary country newspaper, are given to their readers upon the principle, that they are acquainted with the outlines at least, of this fashionable, interesting, and highly practical science. It is hence not merely important, it is indispensable, as a branch of common education in the most common school, and even an appropriate subject for early childhood, while under the guidance of a mother’s hand, and unfit for the restraints of a school room.